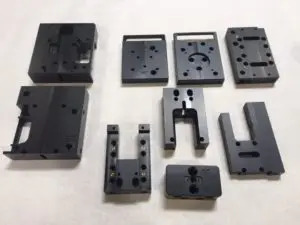 With so many machine shops out there, it would seem like finding a quality supplier of machined plastic components would be a relatively simple endeavor, but it is not so. The reality is that your run of the mill machine shops deal primarily in metals like copper, aluminum, and brass. Many of the properties of plastics like increased thermal expansion, low melting points, and elasticity make it a difficult proposition to machine to exacting tolerances. For more than a decade now, AOP has mastered the techniques required to achieve precision results in a repeatable manner when machining different plastic materials. With a dedicated staff including engineering support and quality control, you can be assured we have the expertise to get the job done right. As an ISO 9001/2015 registered company, AOP is proud to work with clients in medical device manufacturing, oil and gas refining, food and beverage, and many others who have trusted us with their critical thermoplastic component machining. Whether you require ABS, Acetal, UHMW, Polypropylene, Polycarbonate, or another plastic, let AOP use our expertise to provide a solution that fits your needs. When it comes to precision machining of plastics, not all machine shops are alike. Most deal primarily in metals like copper, aluminum, and brass. However, the properties of plastics like increased thermal expansion, low melting points and elasticity make it difficult to machine to exacting tolerances. So whether you require ABS, Acetyl, UHMW, Polypropylene, Polycarbonate, or another plastic, let AOP Technologies use our extensive plastics machining expertise to provide a solution that fits your needs.